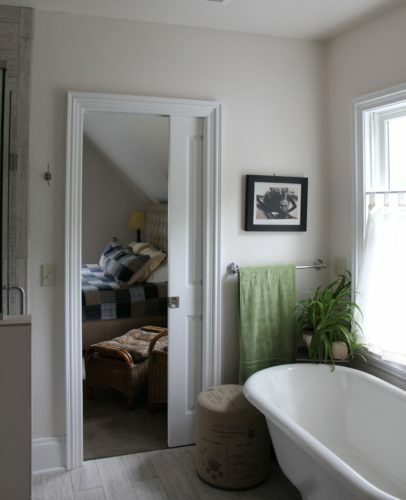 In a 100+ year-old house, the master bedroom finally gets its own master bathroom. After living in the house for a few months, the new owners knew they needed a master bathroom. Through the design process, we collaborated to create a space that would make getting ready for each day easier and more enjoyable. Claiming an unusual space that had likely been used as a nursery, the small space between two bedrooms became the full bathroom. 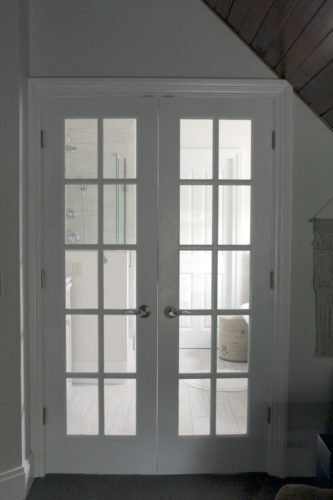 In the newly-remodeled space, reclaimed French doors lead from the guest bedroom (used as a dressing room) into the master bath, creating a bright and inviting ambiance throughout the second floor master suite. The clients were inspired by clean, neutral colors and an elegant, spacious, unfussy aesthetic. Bright, natural light was a must-have for this project, and the whole bathroom makes use of ambient and direct sunlight. 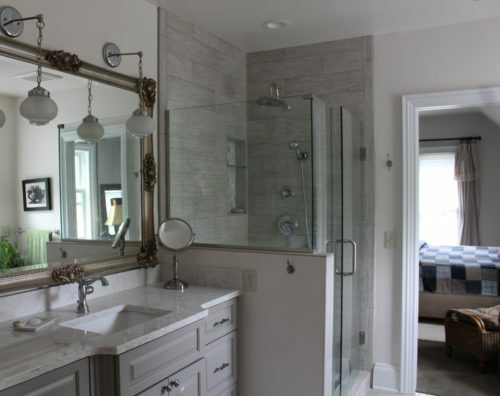 Here, a glassed-in shower provides plenty of light and keeps the airy bathroom from feeling compartmentalized. A pocket door provides access to the master bedroom without the door swing taking up floor space. 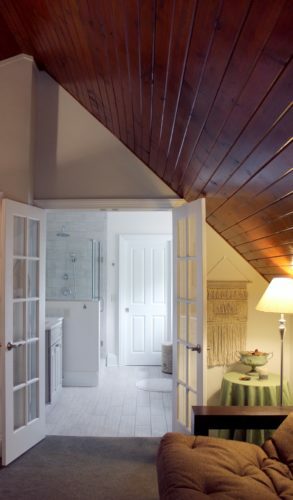 The master bedroom’s original closets were removed to allow the bed to sit just under the slope of the ceiling, creating more space in the bedroom and easier access to the master bathroom. The antique claw-foot tub was placed under the window, allowing beautiful light to flood the room. Clean, pale colors in the tile and wall paint keep the room bright while allowing accent colors to really pop. 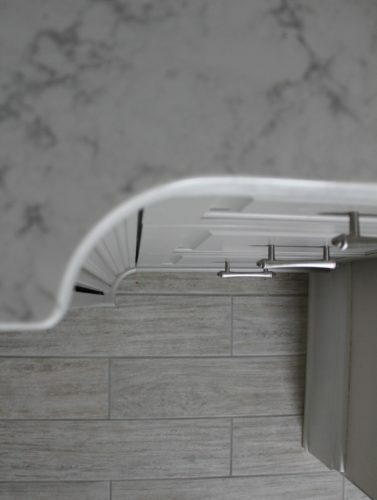 Finely-detailed cabinetry makes the most of the limited space. The sink area occupies what used to be a shallow closet with bifold doors, so cabinetry with varying depths keeps the bathroom from feeling cramped. 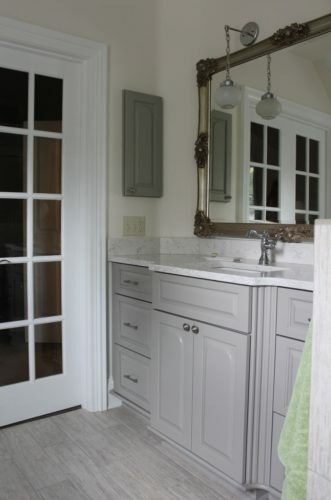 The cabinet color, a soft dove grey, is soothing without feeling cold or clinical. Antique accents, like this reclaimed light fixture and intricate mirror, mesh with the new construction for a space that reflects the era the historic home was built in. When the guest room is not needed for company, light flows from the bathroom into the guest room, making it a cozy place for reading and providing plenty of space as a dressing room. All in all, the project brings new life to an old space, making this home more livable–for both the owners and their out-of-town guests.